Aachen is a quite important town situated close to the Dutch and Belgian frontier it was the place during WWII of Havy fight since it was the first important town that was conquer by Allies troops. 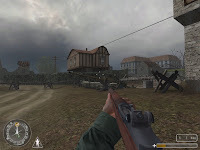 This one is the second attempt from Yorshire Rifles to recreate a important moment from WWII especially since it was the first town in the German part to be conquer. Design is one more time highly enjoyable especially regarding the diversity you will encounter during you progression, form the outskirt to the center place. There was in my opinion a really good reproduction of Aachen city that just bother me for one thing in the outskirt: the road made of earth and not from a harder material (whish is quite unlogic for me but i could be wrong). For the rest the way to create destroyed house, crates, trenshes was really neat. 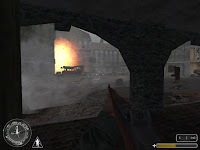 Gameplay is the part that i didn't like to much, but Steve warned us in the readme me that the battle of Aachen was a quite intense one, and indeed it is, several spot took me 'age' and tons of reload to pass (especially the bunker in the outskirt and the first entry in Aachen with the tank to destoy), neverteless all items are quite well placed and provides you ammo and health when you really need them. Progression is a good mix beween intense battle and more sneaking area when you can breath for a while. Another good point was the well organized objectives that give always a new one letting you the filling when achiving the last one 'it's finally it's up!' but certainly with a great proud, since it's highly challenging. In conclusion: Another defenetly must from Yorshire Rifles that retrace another intense moment of WW2. There is mostly only enjoyment in this map with a small touch of frustration that doesn't, hopefully, switch to hate...highly recommanded.